The Mars 3 Musketeers candy bar offers the wonderfully delightful and classic combination of chewy nougat and sweet, whipped milk chocolate. One of world's favorite light and fluffy chocolate bars, the 3 Musketeers candy bar is the perfect snack for anyone who desires a rich, smooth and creamy chocolate-on-chocolate taste. 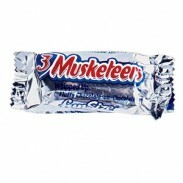 Interestingly, 3 Musketeers candy bars started out as a package of three candies in the year 1932. The popular candy featured three distinct and delicious flavors – vanilla, strawberry and chocolate - although the chocolate flavor proved more popular than the other two. Shortly after the introduction of the 3 Musketeers candy bar, in 1945, Mars changed their product to a single-flavored, all chocolate candy bar – the same candy bar that we all know and love today. 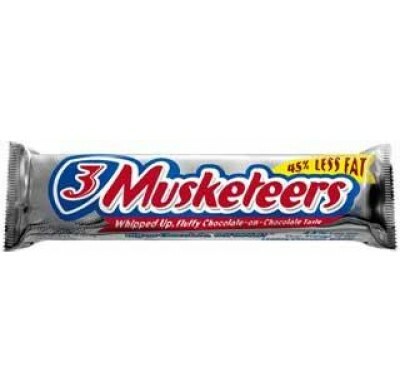 Sweet City Candy offers 3 Musketeers bars at our low wholesale prices, available now in a 36-count box of individually wrapped candy bars. Place an order to today and enjoy bulk 3 Musketeers from Sweet City Candy. Sweet City Candy is your wholesale candy headquarters. Enjoy 3 Musketeers candy bars delivered fast, right to your door at low wholesale prices.